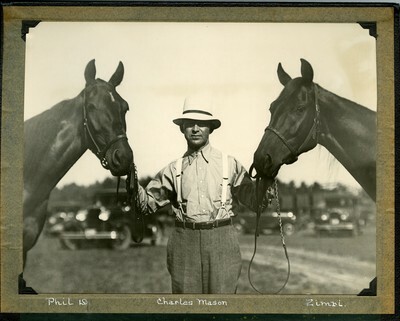 Black and white photo of harness racing driver Charles Mason of Medford, Mass., posing with brown gelding, Phil D., and bay gelding Zimri out of the stable of W. H. Wright, Fort Fairfield, Maine. The photo was likely taken August 21, 1931 at Skowhegan Fair Park, Skowhegan, Maine. The photo is mounted inside the front cover of the album identified as 1931b.